Posted April 9th, 2015 at 10:55 am. What do zines have to do with a cultural-studies analysis of the topic of food in global East Asia? Or, for that matter, how does Googlemaps relate to the food practices of communities of the Chinese diaspora? Students in an advanced topics class taught by Shiamin Kwa, an assistant professor of East Asian Languages and Cultures, have been developing answers to those questions as they explore East Asian culture and history, at home and abroad, and learn to apply tools of cultural analysis through the lens of food. Everything but the Table: Food and Culture in East Asian Literature and Film combines mainstream classroom techniques with less conventional methods, both digital and analog. On the conventional side are a rigorous reading requirement (about 500 pages a week), an analytical essay on a primary source, and a fieldwork project that introduces students to ethnographic research methods. And in true blended-learning fashion, the class incorporates digital tools, with students collaborating on a course website, an online forum for response papers, and an assignment requiring students to use mapping software. Among the responses? A compendium of the food trucks in University City, an analysis of the American diner, and an annotated map of an Asian supermarket in Philadelphia’s Chinatown. Part of Kwa’s mission is to engage students in different modes of thinking. “In recent years,” she explains, “I have been incorporating projects that involve the process of making something (whether by drawing, writing an adaptation, or making a very short film) as an assignment that forces students to think critically about their chosen cultural object in an unconventional way. That’s where the zines come in. 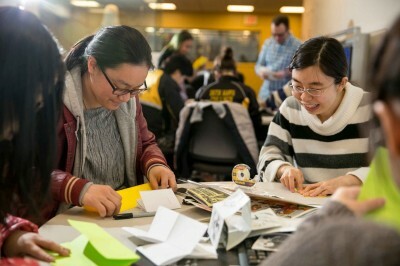 At one recent class session held in the new Media Lab in Carpenter Library, guest artist Shing Khor led a workshop on making zines—small-run, self-published magazines—that spanned the digital and analog. For Kwa, the unit addressed the twin issues of theory and practice: “The content of Khor’s work overlaps with a lot of our course themes—identity issues related to ethnicity, gender, and class,” she explains. But Kwa realized, too, that Khor—who creates her comics by hand but uses digital media to share them—would be the perfect person to guide students through “the tactile and sensorial aspects of doing things in an analog way.” To make their zines, students were given a template that folded into a simple eight-page booklet. Khor supplied some context, showing examples of her own and others’ work, and a table full of art supplies. At the end of the workshop, students made copies to share. Her students proved up to the challenge. Final products included There’s always Time… tick tock… a meditation on time by the Chang Sisters (Tina ’15 and Gina ’17); The End(s), a darkly comic piece by Xue Jin ’15; and two culinary treats—Rice Lover’s Palace by Binglei Yan ’16 and Chinese Food in Different Countries by Yi Mei ’17. Interested in making your own zine? Kwa suggests looking at this site. More images from the zine workshop.